A Plus Size Sweater. Knitting-Crocheting. A plus size sweater. What does that mean? 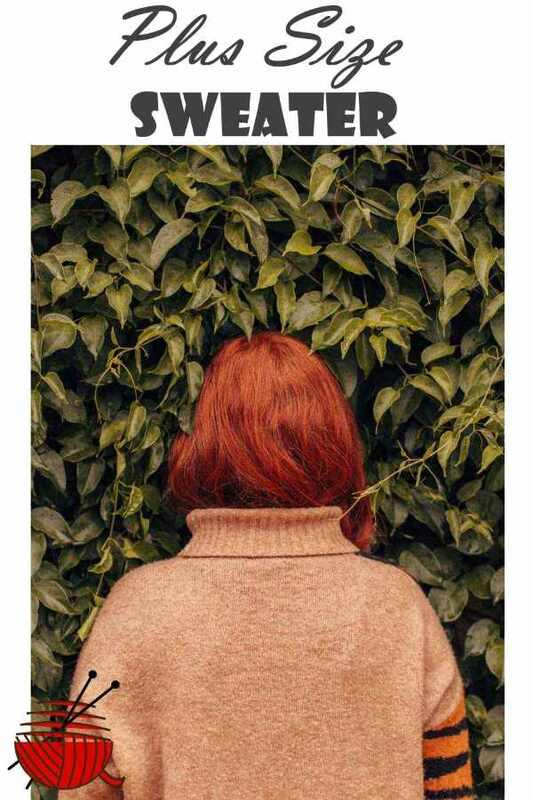 Your garment (sweater, dress, pullover, coat, and etc.) is a "plus size" if your bust circumference is more than 100 cm (40 in). If we talk about knitting or crocheting a lady sweater, it means that we have to alter the pattern of a regular size sweater to suit the features of a plus size body. What kind of changes do we have to make? If you check two dimensions on your body : back waist height (BWH) and front waist height (FWH), you will see that (FWH) is always greater than (BWH). The greater is your size, the more difference will be noticeable. The way to compensate this difference is to make a dart at the bust. To choose an easily stretching or lace pattern to crochet or knit a plus size sweater. It will compensate the difference in a natural way due to its ability to change shape easily. To add a few extra inches/centimeters to a side seam of the front part of a sweater. Extra inches have to be distributed at the level of the bust line, to make the side seams of the front and back parts equal. If you are not sure these methods can solve the problem, a dart at the bust has to be made while you knit or crochet a plus size sweater. There are a couple of things which have to be taken into consideration. 1. Don't rely upon your intuition. The depth of a dart has to be calculated according to your measurements. 2. Keep in mind when choose a stitch pattern for your project, that a dart can distort a pattern. To make it look nice, you can either find a stitch pattern which will "mask" a dart or you should knit/crochet a dart in a way which makes it looks like a decorative seam. You don't really need a full scale pattern. But if you chose to draw a small sketch instead, it has to have all your numbers on it. This way you can easily control dimensions of your sweater. Now step by step instruction how to make a pattern for a plus size sweater. 1. Using your measurements, make a sweater pattern base grid. 2. Following the instructions at Make a Sweater page, draw a pattern without a dart at the bust. 3. Make 4 additional measurements (see the picture). - 1/2 hip circumference (HC/2) - measure around the fullest part of the hips. 4. Draw a dart at the bust. The measurements which are used in this example:(BC/2) = 10 cm (4 in), (BWH) = 38 cm (15 in), (BH) = 26 cm (10 in), (HC/2) = 52 cm (20,5 in), (FWH) = 43 cm (17 in) - front waist height measurement (you made it when drew a base grid). 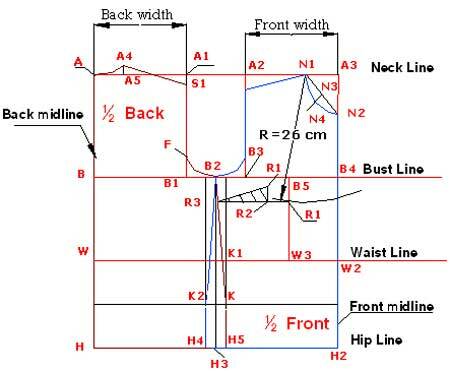 Between the Bust and Waist lines draw a segment B5W3 parallel to the line A3H2. Distance B5B4 = W2W3 = (BC) = 10 cm (4 in). From point N1 as a center, draw an arc with a radius R = (BH) = 26 cm (10 in). Through the point of intersection R1 draw a horizontal line R1R3. If you still don't like the idea of making a dart for your larger sized sweater, here is a hint for you. You can increase the length of the front part by the length of the segment R1R2 if it is not greater than 2.5 cm (1 in ). Some stitch patterns will "forgive" you this kind of violation. Otherwise I would recommend you to knit/crochet a dart. 5. To change the line of the side seam for both front and back parts . Draw two vertical parallel lines from the both sides of the line H3B2. H4H3 = H3H5 = ((HC/2) - (BS/2)) / 2 = (20.5 in - 19 in) / 2 = 0.75 in. Find a midpoint K of the distance K1H5. Draw a horizontal like through the point K.
A side seam of the front part: draw the straight lines through points: B2, K2, H4. For the back part through points : B2, K, H5. Your pattern of the plus size sweater is ready.